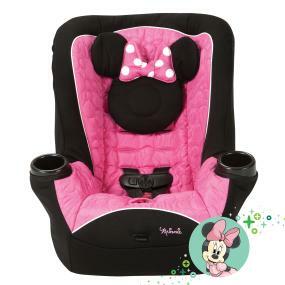 The Disney Baby Minnie Mouse Apt 40RF Convertible Car Seat allows babies to remain in a safer rear-facing position from a tiny 4 pounds up to 40 pounds and 40 inches in height. Need a safe seat for your toddler? The Apt moves into a forward-facing position for children 22-40 pounds and 43 inches in height. Travel is more fun with Minnie Mouse along for the ride! Our adorable Mouseketeer Minnie fashion will have your little mouse riding in style. The mouse-ear head rest keeps heads extra cozy, and the subtle, sweet silhouettes in the premium pink fabric help make every ride both extra comfortable and fun. 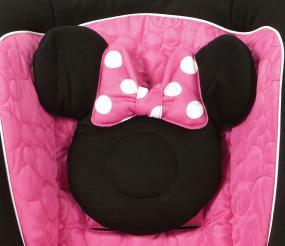 Minnie’s signature adds a special touch that completes the seat perfectly! The Apt 40RF Convertible Car Seat’s five harness heights and three buckle locations easily accommodate growing little ones. The secure 5-point harness is equipped with convenient up-front adjustment. Whether your little one is using a bottle or sippy cup, the two cup holders keep drinks conveniently within reach. 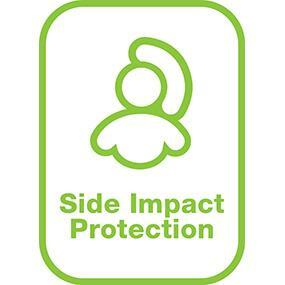 Side Impact Protection is built right into the seat to help keep your child safer in a side impact crash. With LATCH, it’s easier to install the seat quickly and correctly.